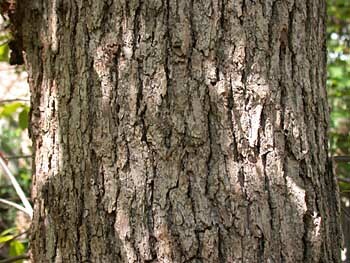 Blackgum is a medium-sized tree common throughout North Carolina. 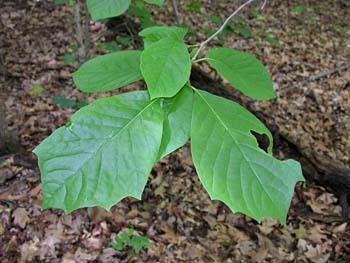 The leaves are alternate, usually entire (not toothed), and glabrous (smooth). 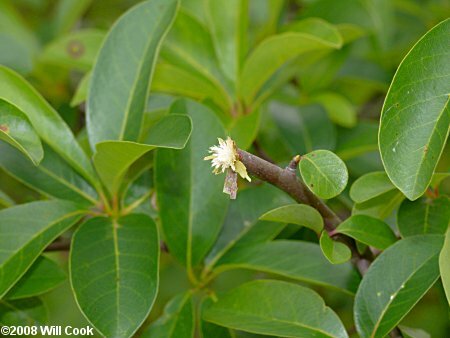 They are frequently confused with the similar leaves of Common Persimmon. 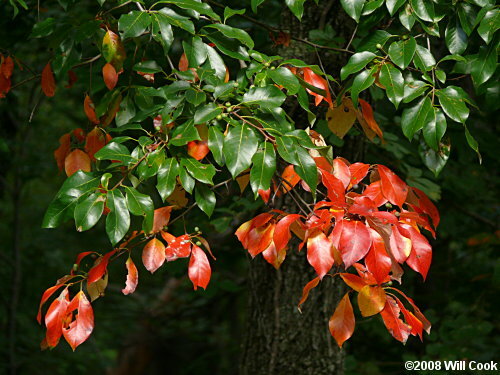 If the leaves are glossy above, turn red in the fall, or have a few remote teeth, they're Blackgum, not Persimmon. 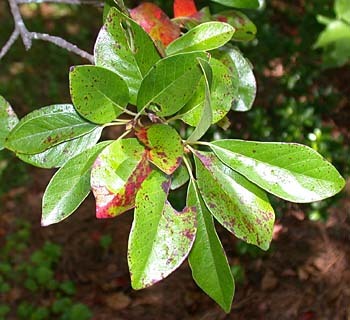 If they're not, it still could be Blackgum — look for fruits or check the number of bundle scars (3 for Blackgum, 1 for Persimmon). 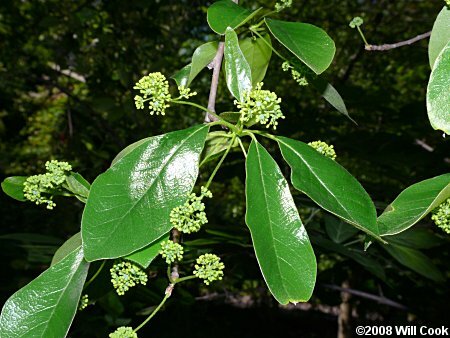 Blackgum is often called tupelo in North Carolina and pepperidge in the northern US. One of the first trees to turn color in the fall, the autumn foliage is usually brilliant red-orange. 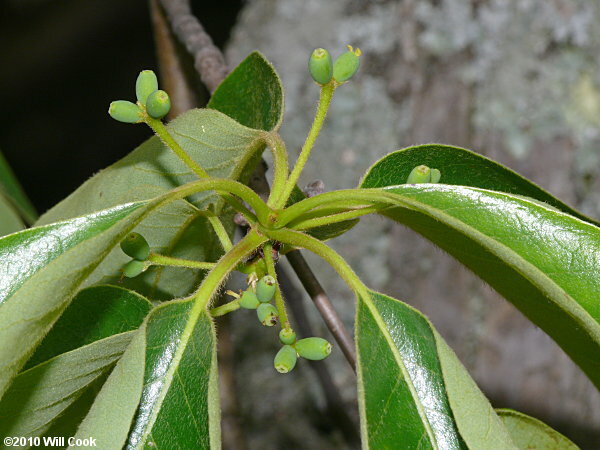 Leaves sometimes have a few large teeth, which can make them look a bit like those of the related Water Tupelo (N. aquatica) of swamp forests in the Coastal Plain. This is just a variable growth form, not a different variety. These leaves were in full shade at the bottom of the tree -- the amount of light may have an influence on leaf shape. Ripening drupes. They are purplish-black when ripe. 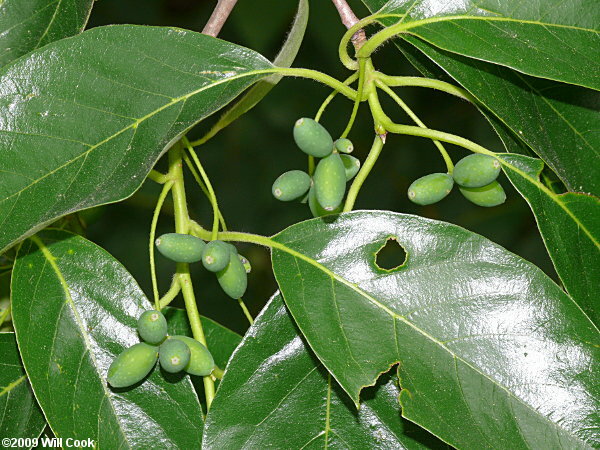 The branches of Persimmon and Blackgum are more different than the leaves. 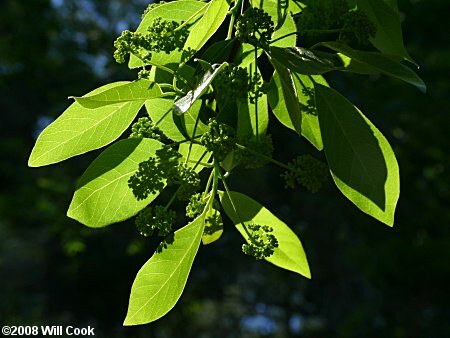 In Blackgum the main branches tend to be horizontal and the leaves are clustered on short spurs of smooth branches. 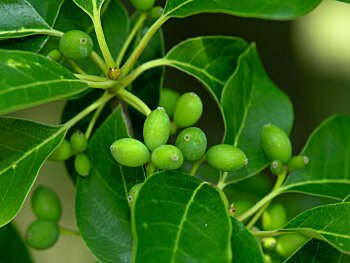 In Persimmon the main branches are not horizontal, the leaves are more evenly spaced on longer side branches, small branches are hairy, and the buds are blackish. 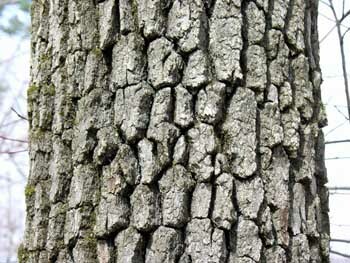 Bark of a different mature tree. The wood of Nyssa is tough and fibrous, and branches do not break easily. Twirled around enough, they eventually break, and can be used as a substitute for a toothbrush. Thanks to Brantley Bowen, Park Ranger at Lumber River State Park, for this tidbit.